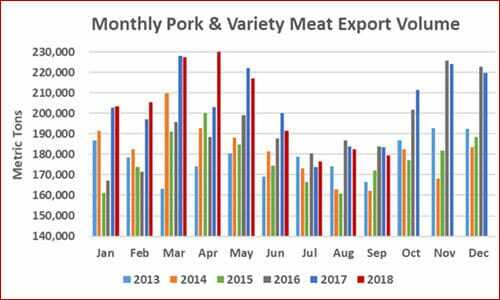 September pork export volume was down two percent from a year ago to 179,423 mt, while export value fell seven percent to $470.2 million. Pork muscle cuts were two percent higher than a year ago at 146,542 mt, but value still declined three percent to $397.6 million. September variety meat exports dropped significantly in both volume (32,881 mt, down 18 percent) and value ($72.6 million, down 21 percent). For January through September, combined pork and pork variety meat exports were one percent above last year’s record pace at 1.81 million mt and two percent higher in value at $4.79 billion. For pork muscle cuts only, exports increased six percent from a year ago in volume (1.46 million mt), valued at just under $4 billion (up six percent). "With a full quarter still to be reported, beef export value records are already being surpassed in some markets and global value is on track for $8 billion by year’s end," said USMEF President and CEO Dan Halstrom. "Pork exports have also held up relatively well, but unfortunately the obstacles US pork faces in China and Mexico are putting a lot of pressure on export value." September pork exports to South Korea increased 33 percent from a year ago in volume (12,486 mt) and 30 percent in value ($33.6 million). Through September, exports increased 43 percent in volume (172,022 mt) while export value climbed 48 percent to $489.2 million – already topping the 2017 year-end total of $475 million. US share of Korea’s total pork imports has increased dramatically this year, from 31 to 35 percent, even as imports also trended higher from most of Korea’s main suppliers. Exports to Japan increased 2 percent year-over-year in both volume (295,346 mt) and value ($1.22 billion). This included a two percent decrease in chilled pork volume (155,395 mt) while value held steady at $750 million. US share of Japan’s total imports has held relatively steady this year at 35 percent. But with CPTPP set to enter into force 30 December and with the Japan-EU Economic Partnership Agreement also on track to be implemented in the coming months, US pork will soon face significant tariff disadvantages in its leading value market. Despite a fourth straight month in which shipments were below last year’s level, exports to leading volume market Mexico remained one percent ahead of last year’s record pace at 589,235 mt. Export value, however, has felt intense pressure from Mexico’s retaliatory duties, dropping eight percent to $1.01 billion. Canada’s January-September exports to Mexico were up 20 percent to 93,346 mt (valued at $126.5 million, up 25 percent). EU exports also surged to Mexico in July (1,809 mt, up 747 percent) and August (2,343 mt, up 733 percent) and are expected to continue gaining momentum as Spain, Denmark and Germany take advantage of Mexico’s recently implemented duty-free pork quota. Exports to China/Hong Kong declined 26 percent from a year ago to 277,779 mt, with value dropping 14 percent to $667.9 million. This region is the largest destination for US pork variety meat exports, which were down 27 percent in volume (177,747 mt) and 13 percent in value ($466.2 million).